The Expansion exists to reach people from age 18 through "30 something" with the message of faith. We meet every first Thursday of the month at 7:00 pm. Experience a great time of worship plus a relevant and challenging message. Doors open at 6:30 pm for coffee and conversation. Our services are geared towards building faith, relationships, learning who we are in Christ, and helping you discover and gracefully walk out the purposes of God for your life. Our whole purpose is to see people saved, healed, set free, equipped, empowered and serving. 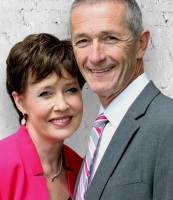 Our Founders and Senior Pastors, Pastors Philip and Michelle Steele are dedicated to raising up generations of leaders for our cities, states, nations, and world with the Word of God and it starts right here with you! You are at an important part of God's plan to bring freedom, restoration, healing, and love to all those you are in community with. Let's grow in all that God has for us by building people's faith and framing their world by the Word of God!